Center Street WPCF in Mt. Pleasant, SC. The Lowcountry is often used to describe a large region incorporating a number of counties in South Carolina. The moniker is apt, because this region is flatter than flat. 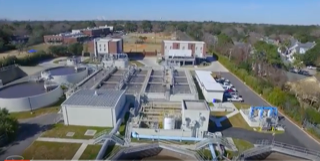 This topography creates a unique challenge for wastewater treatment operations in the coastal communities situated along the South Carolina shoreline, as Greg Hill, Wastewater Operations Supervisor at Mount Pleasant Waterworks in South Carolina explains. 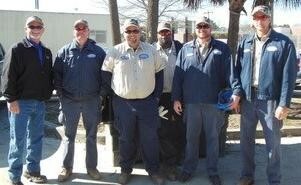 “In 2012 we did an assessment of the infrastructure at our Center Street Wastewater Treatment Facility. As part of a capital investment program we resolved to upgrade the mixing technology at this facility. There were a number of concerns with the legacy diffused air mixing system we had in place at the time as it was energy intensive and unable to mix effectively at low water levels in our equalization basin. Moreover, we wanted an equally low maintenance alternative to mechanical mixing in the planned ASB basins. The EnviroMix BioMix system works well at variable water levels in the equalization tank due to the use of compressed air as opposed to the low-pressure air systems that normal aeration systems require. Some 72 nozzles are distributed across the mixing basin floor, preventing the build-up of solids even when water levels fall to very low levels. This flexibility proved to be a life-saver during Hurricane Irma, the worst storm event to batter Coastal Carolina since Hurricane Hugo. In September 2017, the Lowcountry was hit hard by Hurricane Irma; the city and many local neighborhoods experienced a 10-ft. storm surge – one of the worst tidal surges since the unforgettable Hugo. Yet, according to Mr. Hill, the Mt. Pleasant treatment facility did its job even under the worst surge conditions: “We didn’t spill a drop when the storm surge arrived, even though it happened during high tide and tidal water flowed into manholes from the collection system and residential clean outs – we held up well to the storm.” Fortunately, when the storm passed and low tide set in, conditions improved drastically. Contact Dave Lauer for more information at dlauer@enviro-mix.com.